Ranger Z520 Comanche powered by the Evinrude E-TEC 250 H.O. What do bass fishing fanatics want? Comfy seats? High-tech fish tracking gear? 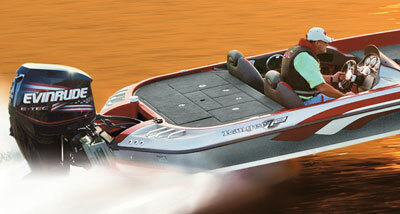 Those features are great, but what is most important feature of any bass boat? Get to where the fish are…and get there first. According to Ranger Boats, the Z520 Comanche by Ranger Boats offers bass tournament performance and features for those competing for trophies, or for anyone who wants bragging rights rights back at the dock after a long day of fishing. A high-performance fishing platform like the Ranger Z520 Comanche is the ideal platform to showcase Evinrude’s newest addition to its popular E-TEC lineup, the E-TEC 250 H.O. Coupled with the advanced technology and superior performance of the all-new Evinrude E-TEC 250 H.O., the Z520 benefits with rapid hole shots and a strong top end delivery. Evinrude’s E-TEC technology also delivers the only outboard in the industry built to go three years or 300 hours with no dealer scheduled maintenance. With no oil changes, no belts to replace, no break-in period and no need for a dealer to winterize, the 250 H.O. is clearly a strong match for the new Z520.